A beautiful high quality chest of drawers in Birdseye Maple with Purple heart moulded and banded decoration. The graduated drawers flanked by inset panels of which are banded in Purple heart. 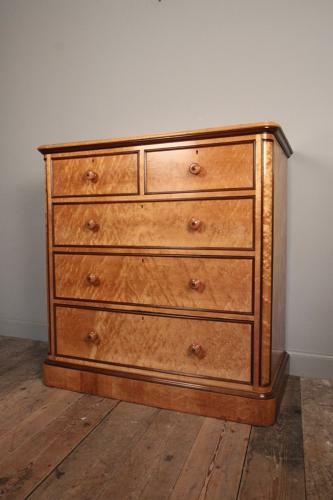 the drawers are all fully Mahogany lined and retain the original knob handles, locks and escutcheons. This striking chest of drawers is raised on a plinth base with good even colour, wonderful graining and finish throughout. English, Circa 1870. Att. Holland & Sons. Established in 1803 by Stephen Taprell and William Holland, a relation of the architect Henry Holland (architect). Always on the leading edge of fashion, Holland & Sons employed some of England’s foremost designers and participated in all of the International Exhibitions of 1851, 1855, 1862, 1867, 1872 and 1878. Holland and Sons also participated in many of the leading international exhibitions including London in 1862, Vienna in 1873 and Paris in 1867 and 1872. Their earliest known commission was to furnish the Athenaeum Club, London, 1824- 1838. They also worked alongside the prestigious firm of Thomas Dowbiggin at Osborne House, and eventually took over their premises and business at 23 Mount Street, London in 1851 and 1853 respectively. In 1851, when the company was based in Mount Street and employed 351 people, they won a prize at the Great Exhibition for a bookcase. By then, after being granted a Royal Warrant of Appointment (United Kingdom) early in the reign of Queen Victoria, they had already taken a leading part in the decoration and furnishing of Osborne House, Sandringham House, Balmoral Castle, Windsor Castle.